Carlo Crocco established Hublot in 1980, releasing his ‘Classic’ model which paired precious metal with rubber. The concept, at the time, was unusual and represented the start of the brand’s love for fusing different materials. In subsequent years, additional models were released including both diver’s watches and chronographs. The brand’s name, ‘Hublot’, was taken from the French word for ‘porthole’ referencing the circular bezel, retained with screws which appeared on early models. A landmark year in the history of Hublot was 2004 when Jean-Claude Biver, formerly of Blancpain, assumed the role of CEO. Biver, a consummate marketing professional, soon took the brand’s fusion concept to another level. Hublot began working with an array of materials, including carbon fibre, ceramic, kevlar, magnesium, tantalum and tungsten. In 2005, Hublot released its ‘Big Bang’ model, an oversized watch which scooped awards and proved to be an overnight commercial success. The watches sold like the proverbial ‘hot cakes’ and the turnover of the company grew exponentially. The Big Bang was resolutely a masculine watch until 2008, when, for the first time, female models were released. These ladies’ watches featured smaller cases, gem-set bezels and eye-catching colours. Biver also identified other needs within the market and, later in the same year, released a new Classic Fusion. This model exhibited a more discreet character than the Big Bang and offered clientele greater choice. It was no surprise that the rapid ascendancy of Hublot as a prominent player in the luxury watch market would attract the attention of other brands. Crocco sold Hublot to the luxury group LVMH, but the services of Biver and his colleague Ricardo Guadalupe, unsurprisingly, were retained, and the journey of the brand continued in earnest. The King Power, released in 2009, took the concept of the oversized watch a step further with early models measuring a significant 48mm in diameter. Guadalupe became CEO of Hublot in 2012. Biver is now president of LVMH’s watch division which includes responsibilities for overseeing Hublot, TAG Heuer and Zenith. Hublot has always been closely aligned with sport, in particular, football. Over the years, the brand has enjoyed associations with football championships such as Euro 2008 and the FIFA World Cup. It has formed partnerships with teams such as Manchester United, Paris Saint-Germain, Juventus and FC-Bayern and leading figures from the sport, including José Mourinho and Pelé, have been engaged as Ambassadors. The Swiss watch brand has also been linked with cricket, American football, basketball and Formula One. Indeed, its relationship with Ferrari has led to some interesting Hublot timepieces which include models delivered in titanium and ‘Magic Gold’, a scratch-resistant alloy containing 18-carat gold and unique to the watch company. This relationship with sport has clearly brought the brand closer to its target audience and led to the release of various limited edition models which capitalise on the adoration some prospective purchasers feel towards leading sporting figures and much-loved teams. In 2009, Hublot opened a new manufacture in Nyon, near Geneva, and the year after it released its UNICO movement. This in-house chronograph calibre includes a column-wheel, interestingly placed on the dial side of the movement. This marked a significant step in the evolution of the brand, signalling a greater degree of independence and mitigating the reliance on third parties. The brand has continued to build on its in-house watchmaking expertise and is now able to offer complicated movements, including tourbillons. Hublot has rapidly grown in its relatively short history. It has produced watches which exhibit their own unique character, ingeniously pairing different materials and bravely using colour and texture to provide a point of differentiation. In its early life the brand initially used ETA movements and chronograph modules from La Joux-Perret, but with a greater number of watches housing in-house movements, Hublot has become increasingly vertically integrated. The company has arguably overplayed the concept of limited edition models, frequently releasing a dizzying array of new timepieces. This may lead to some limited editions failing to attract premiums over the brand’s regular watches. However, it may also provide opportunities for would-be buyers to acquire a well-kept pre-owned timepiece, at significantly less than new. 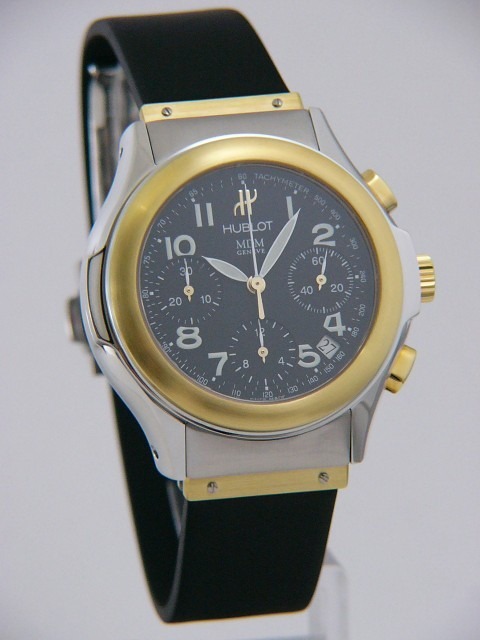 Browse Blowers’ selection of Hublot watches online today.